Getting cast in an international tour is a huge thrill for any performer. You get to see the world and share your passion with foreign audiences. You'll enjoy many moments but also face challenges that come with continuous travel. While touring Japan, here are some tips I picked up along the way. Mara Jill Herman(3rd from Right) in the Japanese Tour of "Disney On Classic"
It’s just as important to manage your time off stage as on stage. For lobby calls, be punctual. It’s essential for the team to make all the transfers from taxi/bus to train to plane. Loading into new venues means the backstage traffic will often shift and vary. Time your entrances, bathroom breaks, and crosses from stage left to right. Stay focused and alert. Research various cities on your itinerary ahead of time. Be adaptable to new hotels, rapid temperature or climate change, different foods, and local crew. When the schedule is tight, you may only see the hotel and venue of a city. But when you can steal an hour or more, set adventure goals with (or without) a buddy. The exploration will be worthy of your Instagram account and become the stories passed down to your grandkids. It’s great to be a team player and participate in company outings but also essential to strike a balance and bow out at times. Get rest, take your vitamins, wash your hands, and stay hydrated. When the nearest gym isn’t cutting it (or is non-existent), find hotel-room friendly workouts on YouTube. I alternate between “Billy Blanks Celebrity Fit Sculpt” and “Yoga With Adriene.” Have allergies? To avoid the risky “grab and go” food options, bring a hot plate and pan to closely monitor your intake. Tour can feel like a bubble because you live where you work. You’ll crave your creature comforts and it’s normal to feel homesick at times. Missing your social life, significant other, dog, and family members? The easiest way to combat the roller coaster of emotions is to arrange phone and Skype or FaceTime dates. If you set specific times with your posse back home, you’ll have something to look forward to. Nothing like a familiar face to lift your spirits! As you go from city to city, you will be greeted by the most incredible fans and loyal theatergoers. Stage door interactions are wonderful but you may want to establish digital boundaries. Adjust your Privacy Settings on your personal social media accounts to control how fans interact with you when the work day is done. Some artists utilize a Fan Page or Profile in addition to their personal accounts to stay organized and business-oriented. You are your product, after all. While some tours provide trunks and transfer your heaviest items, you still have to manage them when tour concludes. To avoid overweight baggage fees– and an airport meltdown – buy a small digital luggage scale. I use Balanzza’s scale which grips right in my hand, buckles onto my suitcase, and keeps my souvenir buying in check. When signing your contract, make sure you provide your company with the same name that matches your official government documents. This helps avoid airline hassles so you can board easily and preserve your frequent flyer miles for free trips. Not a member yet? Sign up with any major airline or credit card. A simple Google search will lead you to participating airlines when you fly internationally. There are points just for joining, with restrictions of course, but with benefits from all the different programs partners, your rewards add up faster. Before you leave, get a credit card with no international transaction fees to build credit while abroad. International airports typically have the lowest transaction fees for changing your money to the local currency. And remember to carry your passport when you plan that shopping spree: Many dutyfree establishments will waive the taxes on your purchases above a certain threshold. Flash your passport and your savings are golden! Challenged by a new language? There are many free apps like Duolingo that will help you practice and keep your mind stimulated on travel days. Google Translate app has an amazing camera feature: Simply hold your device up to the foreign text and the translation will appear on screen! Journal. Take photos and videos. 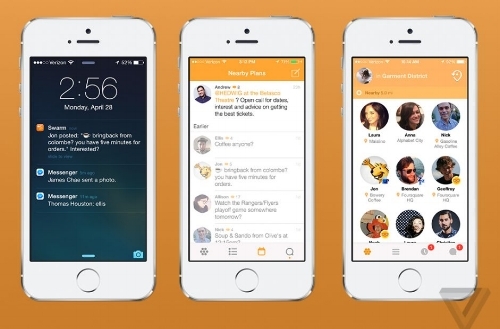 Swarm, a timeline-based free app, allows you to check into locations, write anecdotes, and tag photos to capture the memory. I’m so glad I invested in the ExoLens with Optics by Zeiss for my first Asian tour. It’s small, lightweight, and easy to throw in a purse or backpack. The bridge slides onto my iPhone and the lens threads in effortlessly. You need to remove your case and screen protector for shooting but the high-quality, wide-angle images are worth it! It’s important to live in the present while also keeping an eye on future projects. When you can’t physically get to an audition, offer a self-tape. I travel with a small tripod, an IK Multimedia iKlip Grip Pro Multifunction Camera Stand, which works seamlessly with my iPhone. It weighs 7.8 oz and extends up to 24.2 inches. This accessory enables me to stay proactive in my career and feel self-sufficient across the globe! Write a song. Knit a sweater. Draft a play. Create a podcast. On days off when you don’t feel like exploring, dive into old hobbies that may have fallen by the wayside. Before you hit the road, seek guidance from friends. Find out how they stayed productive and maximized their downtime. You have the luxury of time, so take advantage of the incubator–and create. Mara Jill Herman is chronicling her performance adventures in Japan as Guest Contributor for UArts College of Performing Arts' blog. In 2012, she co-authored So You Wanna Be A Superstar? The Ultimate Audition Guide (Running Press Kids). Her writing has appeared on many arts-driven sites including Backstage, BroadwayWorld, Theatre Nerds, and the National YoungArts Foundation. Mara is a freelance writer and member of Actors' Equity Association. Follow her on Twitter @marajillherman and Instagram @marajillherman.